4/10/2018 · Use newspaper or magazine pages to make a lampshade. If you subscribe to a magazine or local newspaper, tossing old papers may account for a lot of your waste. Instead of discarding old magazines or newspapers, use them to cover an old lamp. how to make turkish yogurt drink Cut recycled holiday cards into small rectangles and punch a hole in one end. For the blank side, invite guests and family to write notes of thanks and hope. Hang on fallen branches displayed in a vase. Category Archive: recycled magazines. 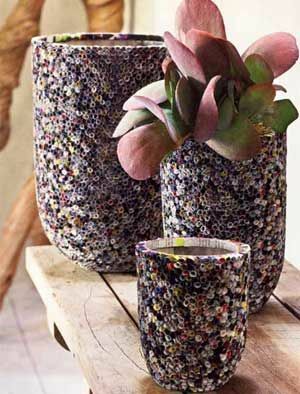 Apr 23. rolled magazines vase- great for kids . Categories: home accessories, home decor, magazines rolled, paper art, paper craft, paper weaving, recycled magazines. by angela. Rolled magazines projects, are so great to do with kids. recycle magazines, upcycled old magazines I think it is one of the most fun upcycling ideas It will keep them occupied for how to make a model car from recycled materials Recycle your old magazines and make colorful, glossy Bangle in your favorite colors! It’s the perfect craft for giving some old costume jewellery a new lease of life; for kids to get creative and make something unique and very pretty. 3/02/2008 · Best Answer: I would cut the paper you choose into strips. You could have them all the same width, or vary the size. Use Mod Podge to adhere the strips on (decoupage). It looks like fun. You searched for: recycled magazine! Etsy is the home to thousands of handmade, vintage, and one-of-a-kind products and gifts related to your search. No matter what you’re looking for or where you are in the world, our global marketplace of sellers can help you find unique and affordable options. Let’s get started! Recycled craft furniture is an eco-friendly and affordable way to add decor to one's home. Companies can incorporate recycled materials into their products to appeal to the DIY demographic. Companies can incorporate recycled materials into their products to appeal to the DIY demographic. Cut the magazine pages into strips. I made the width of my strips the same width as the frame I chose. The frame holds a 3-by-4-inch photo, and each side of the frame is 1 inch wide. I ended up cutting 1-by-7-inch strips out of eight or so magazine pages.